How do I integrate my Store with eBay? The eBay listing module allows you to list your 3dcart store's products directly on eBay where the products may be auctioned or bought outright using eBay's Buy it Now options. Furthermore, as your products are ordered on eBay, the orders can be sent to your 3dcart store's Online Store manager where you can process the orders from one centralized location. Due to restrictions from eBay, orders imported to your store (from eBay) are not able to trigger your 3dcart store's order alert notification emails. The integration does have the ability to send script synchronization emails - which can be used to view when synchronization occurs and if any orders were brought in. However, be aware that this email is sent each time the synchronization script runs (once every hour), so it can fill up an inbox rather quickly. The procedure of listing your 3dcart store items on eBay involves first granting access to eBay's API from your store. Then, after API access has been given, you will create a special listing template that will be used to display your items on eBay. Finally, you will designate which items to list on eBay, how long they will be available, and how much they will sell or begin bidding for. Before integrating your 3dcart store with your eBay seller account, please be sure to list at least one item on your eBay account independently from the 3dcart store. The reason for this is that eBay requires some additional information from you to fully create your seller account before our integration will work completely. This will only be necessary if you are brand new to eBay and have just opened a new Seller Account with them. This article will help you set up the eBay listing integration. This article contains the following sections. Please click on a link below to review its respective topic. The integration between your 3dcart store and eBay is made possible through a special API app created for 3dcart users. The first step in the process of integrating your store is to grant the necessary API access to your eBay account. You should first have your eBay account created prior to enabling the module on your 3dcart store. 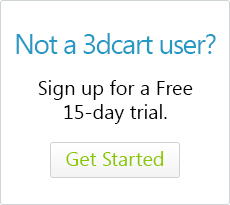 Log into your 3dcart Online Store Manager. You will see three links listed. Clicking on either of these links will take you to a page with a button labeled "Grant Access." You will now be redirected to the eBay login page. useful for placing inital tests before going live with the full integration as no fees are involved. The live eBay API which connects to your live eBay account. Be aware that while using this envorinment, your listings may incur charges from eBay. This is optional, but we recommend first creating a sandbox account for yourself and then having this selected while setting up your store for the eBay integration for the first time (while following this article) as it will not incur any charges to you as a buyer or seller. After your initial set up, you can uncheck the box and re-grant access; this time to eBay's production API; when you're ready to go live with the integration. If you are interested in creating an eBay sandbox login, you will first need to register for their developer program (it's free!) and use that registration to create your sandbox users. We recommend creating at least two separate sandbox users so that you have one that will act as the seller and the other login to act as the buyer. For additional help in setting up the eBay Sandbox account, please review eBay's documentation by clicking here. This will take you to a step by step document that outlines the process of registering as a developer, creating and using the sandbox. The first three topics of the document will cover the instructions needed. Log into your (sandbox or production) eBay account. You will see a page on the eBay interface allowing you to grant the access. Click "Agree" to continue. You have successfully granted access to eBay's API from your store. Be aware that if you initially set the integration for Sandbox mode, you will need to re-grant access to production mode when ready to go live. Your additional settings for the integration will remain the same, only the environment will change from sandbox to production. Here, we will go over your basic module settings. Once access to eBay's API has been granted, your eBay settings page will refresh with additional options to toggle. However, if you need to revisit the page later, use the following steps. At the top of the page you will see the Authentication Status and its validity, its expiration and the last time synchronization of your integration took place. You can also click on the "Perform a check" link to synchronize the integration on demand. Below the authentication information, you will have an area labeled "Reset eBay integration" with a "Reset" link next to it. Clicking this reset link will let you disable the integration module altogether and clear all of your API tokens; effectively resetting all of your 3dcart/eBay integration options. Turn on the eBay integration for your store's products. If checked, this setting will remove the quantity of items listed on eBay from your 3dcart store's inventory. In other words, if you have 10 units on hand of a particular item in your store, and you list 3 of them on eBay, this checkbox will update your store's inventory to reflect 7 units on hand, since 3 of them are designated for listing on eBay. Use this setting if you will be listing items on the eBay Motors service for car parts. Use this field to specify the email address to which syncronization logs will be sent to. Syncronization occurs aproxmiately once every hour. The next section of the page will contain settings for how your eBay orders are managed on the 3dcart store. 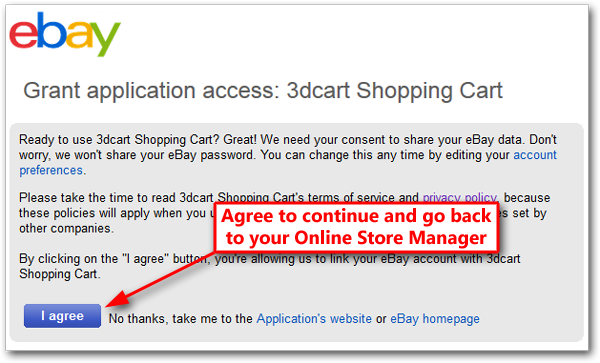 Select this option if you would like all of your eBay orders to be transfered to the 3dcart store. Leaving the box unchecked will only import eBay orders for products you are listing from the 3dcart store. This checkbox will factor in eBay orders as part of your 3dcart store's built-in sales reporting. Be aware that this setting will correlate with the preceeding setting of getting all orders from eBay. If you select the option to "get all eBay orders" described above, upon your initial set up of the eBay integration, your 3dcart will only pull the previous 90-days worth of orders. Clicking this link will display a pop up window with eBay payment options on one side and your store's payment methods on the other. This window allows you to map the payment methods used on orders coming from eBay, and assign (or "Map") them to your 3dcart store's payment methods for reporting and visuals. Without this payment method mapping, the orders coming from eBay will appear with the payment method as blank. Therefore, the sole purpose of this mapping function is to allow you the ability to have the orders' payment methods mapped to something. It can be an offline payment method that you create specifically for eBay orders or a generic payment module not used on your normal 3dcart orders. Keep in mind that this will not affect or incur transactional charges from your payment gateway. The orders are essentially paid for because they were purchased on eBay; but for your 3dcart's internal reports, you may wish to have something present to reflect the payment that was "used" on your store. This allows you to specify a special prefix that will be used on orders being imported from eBay for reference. For example, your store's regular orders may be listed with ab-1234 as the order number, but you'd like your eBay orders to be something like eBay-AB-1235, etc. In this case, you'd enter the prefix as "eBay-"
If you have an actual eBay store, this next section will allow you to pull category structure data and information from that store to your 3dcart store. This can be useful if you would like to have your 3dcart store's category structure match the categories in your eBay store. When making changes to your categories and settings on the eBay store, be sure to click on the Refresh link under your eBay store's information to import those changes to the 3dcart store. These two areas will let you add a header and/footer to your product descriptions when the items are listed on eBay. For example, a logo or some sort of reference to your 3dcart store. Both the header and footer windows can be populated with raw HTML code, or you can use WYSIWYG to format things more easily. Once you have toggled your necessary settings, click "Save" at the top. The next portion of the process involves setting up your eBay product's listing template which is a set of variables that will be used by the eBay listing. During this process, you will configure a series of settings that allow you to control how the product will be viewed on the eBay site, the purchasing and shipping options it uses and several other factors. When designating products to be included on eBay, you will use the created template to display it on eBay's pages. 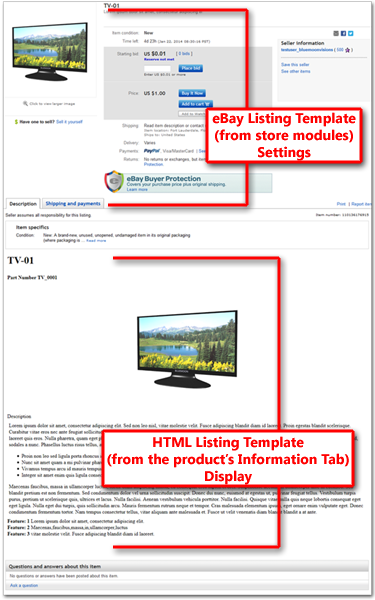 To begin creating an eBay listing template, follow these steps. Use the search bar at the top and search for "eBay" to locate and view the module. Click "+ Add New" at the top right of the page to begin creating a new eBay Listing template. Marking the "Yes" checkbox will hide bidder usernames from being listed on the item when bids are placed. Select this checkbox if you'd like to make this the default template selection for all of your products when it comes time to list them. Below these two checkboxes, you will see a section where you can set the eBay categories where your products (using this listing) can be found. Click the "Change" link to specify the primary eBay Category taxonomy that the products using this template will use. This will help eBay users find your products easier. (optional) Click the "Change" link to specify the secondary eBay Category taxonomy that the products using this template will use. When selecting the categories, you will see the categories and sub-categories listed in red. Clicking on each red category will open up its sub-category structure and so on until you see the final category listed in blue. This category (in blue) is known as the Leaf category. Be sure to click all the way through and select the leaf category for your selection. This setting will only come up for certain eBay categories and it will affect the way products with Advanced Options are listed on eBay. If not marked, each advanced option will be listed as its own individual product on eBay. Select the number of days the listing will be active on eBay. Select whether product measurements will reflect Metric or Standard measurement units. After setting and selecting the above configuration option, you will be done with the general settings of the listing template. You should also see a series of tabs at the top of the page for Specifics, Pricing, Payment, etc. Next we'll describe these tabs and the settings found within them. This tab will contain a series of item specifics and variantions that you can select for the eBay listing. If the Specifics Tab is blank, there's no need to worry. It just means that the particular eBay category that you selected does not have or need variants specified for listing on eBay. The Specifics Tab will be split into two halves. At the top you will set Item Specifics and at the bototm you will set Variations. Item Specifics will usually be things like Brand and country of manufacturer. For Specifics, your selection choices will be either specifics from eBay or those present on the product in your 3dcart store from the various custom fields. Variations will typically be things like options and features of the item. For Variations, your selection choices will be either variants directly from eBay or those present on the product in your 3dcart store from your store's product option tables. Note that the 3dcart store variations will be based on options set for all products on your store - meaning that all of your store's option sets will be listed when selecting variations from your 3dcart store. In other words, if you have some products that use color option sets as well as other products that use size option sets, they will all be listed in the "Use Cart" set of variations. When it comes time to list the actual items however, you will have the ability to specify which option sets are used for the product. If 3dcart Specifics are used, they will also need to be listed as "Advanced Options" on the individual product level. The advanced options will require that a code be specified in its Advanced Options settings as well. Some specifications are strictly enforced by eBay - depending on the category chosen for the template. These will be labeled as such with a note specifying "eBay's option enforced"
You can still use your store's options for these enforced variants, but they will need to be named identical to eBay's naming of the variation. The Pricing Tab will let you set how the template will list pricing for its assigned items when listing them on eBay. The drop down labeled "Select the pricing method" will let you select whether products using this template will be available for "Auction" or "Buy it Now" purchase. The following configuration options will be listed when selecting the "Auction" method. These settings are available to set the Starting Bid price on items using this template. Settings in this section are available to set the bidding's Reserve price which is a minimum bid amount you can designate on products using this template. If the item's reserve is not met during bidding, the seller is under no obligation to sell the item. Buyers will not see the reserve price. Rather, they will see if/when the reserve is met. As part of the Auction pricing method, you can also designate "Buy it Now" pricing options which allow eBay users to purchase the item outright instead of bidding on it. This will set the product's price to the same as the product's current pricing on your 3dcart store (at the time of listing). The product's current price on your 3dcart store with variables (plus or minus) a specific amount or percent. The product's current cost on your 3dcart store with variables (plus or minus) a specific amount or percent. Use this to designate a specific price. For Auction Pricing, Starting Pricing is required. Reserve Price and Buy it Now pricing are optional. Please also be aware that the Starting price must be lower than the Reserve Price. Furthermore, the Buy it Now price must be at least 30% over your starting price. The Buy it Now pricing method is available if you'd like to have the eBay product listing available for only direct purchase instead of bidding/auction. The settings for this method are the same as listed for the "Buy it Now option under Auction. If you have configured this template with variants or product specifics selected (in the "Specifics" tab) you will need to use only "Buy It Now" pricing as Auction Pricing is not available. Pleace a mark in each method you'd like to use on the product listing. For PayPal, Simply specify your PayPal email address to have payment posted to your PayPal account. The checkbox to the right of the email field can be checked if you would like to have the buyer pay for the order immediately or if you'd like to charge them only after winning the bid. Here you can enter a description of your Payment Methods or details for eBay users as to how payment/ordering will be handled. In regards to charging Tax on orders, please be aware that the tax rules will be set on the eBay account's side of the equation using eBay's tax tables. More information on using their tax tables can be found by clicking here. Use the Shipping tab to specify your shipping options for the eBay listing of products using this template. Select your average order handling time. This information will be factored into the eBay listing's order delivery estimates. This checkbox is used to designate locations that you do NOT wish to ship to. When marking the checkbox, you will be given the options of selecting regions and individual locations within those regions which your listing will not ship to. If the eBay purchaser has a primary shipping address to any of the selected locations, eBay will block the sale. Select your Domestic Shipping calculation methods. Using this method you can select various shipping methods that will be used for the order and specify a flat rate for each - regardless of where the domestic destination is. Calculated - Cost Varies by Buyer Location: Using this method, you can select services that will be used and the shipping calculation will be handled by eBay depending on where the domestic destination is. When selecting a calculated shipping cost, an additional drop down mindow will appear beneath your "Handling time" option above. Use this to select the type of packaging the order will use when calculated by eBay. For example, Large Envelope, Package, Large Package, etc. Enter your domestic handling costs. This field is an eBay requirement. Please be aware of the shipping limitations and requirements for the selected shipping carrier since this information will be applied to the product. For example, USPS First Class Package has a weight limit of 13oz, and your product dimensions - when using this template - must fall within this range. If you are willing to accept international orders, select the method you would like to use for product using this template. Disables orders to International Addresses. Using this method you can select various shipping methods that will be used for the order and specify a flat rate for each - regardless of where the international destination is. Using this method, shipping calculation will be handled by eBay depending on where the international destination is. For these last two International Methods, you will need to specify either Worldwide locations or a specific area. If setting up for International Shipping, you will also have the field where you will need to enter your international shipping handling costs. This field is an eBay requirement. In the Other Tab, you will have the ability to specify additional settings for the eBay product listing(s). Items are brand new in original packaging. Items are new with other conditional specifications. The details of which can be included in the text box below this section. Items have been refurbished or repaired by their respective manufacturers. Items have been refurbished or repoaried by the merchant selling the items. Items are being sold in used condition. Items are not functional and only being sold for spare parts or other details. As mentioned above, the area beneath the item condition area is an open text box in which details of the product's condition can be listed and displayed. You are willing to accept returns and exchanges you can set the Return Policy to this and configure additional return settings. Use the provided drop down menus to set your variables. Use the provided drop down menus to set your variable. Take the title of the page (product name) and display it in Bold text. These enahancements will incur additional fees from eBay. Once you are done with your Listing Template Settings, click "Save" at the top right to store the information. If there are any missing parameters, the store will warn you of what may be missing, so you can correct it and save the template fully. Now that your Listing Template Variables are set, the next steps in our process will be to select individual items for listing on eBay. You may have a wide range of products that are present in many different categories, or perhaps you'd like to have different pricing and purchasing schemes for similar items. Therefore, you can create as many templates as you'd like or need for your store. For the purposes of this tutorial however, we'll just create the one template and proceed with the next steps. By now, you should have your store's global eBay settings configured and at least one eBay listing template created. The next step in the process is to list your desired items on eBay. To list your products, please use the following steps. Click on the button labeled "List on eBay" to proceed. In the eBay Listing section, you will see a section labeled "Active Listings" along with a numbered link which will take you to the eBay Listing manager (filtered automatically) for the product if it is already listed. You will also see a drop down for the "HTML Listing template" used for the product's eBay listing. This HTML listing template is not to be confused with the eBay listing template created in the previous portion of this article. That particular "template" contains the variables that your store will use for the product listing's buying options on eBay like starting bid price, category, shipping methods, etc. However, if you'd like to create your own styles for the display of the listing, you can create your own template and name it "listing_ebay_x.html" where "x" is a number other than 0. Then, when you upload the new template to your specific Theme folder (via FTP) you will see it in the drop down as "Style 2" or "Style 3" accordingly. If you are using eBay Motors for the listing, you will also need to select the eBay Motors Product ID by searching the eBay catalog. Simply search for the part number and a list of candidate products will appear that you can select. (or click "Execute it Now" to begin it immediately). "Use this quantity for all products"
As mentioned previously, if you are listing a product that has options available to it, but without eBay variations being used (in the general tab); then you will really be listing each variant of the item separately. For this reason, the "Use this quantity for all products" setting is there if you want to list the same number of units for each variant listing. After setting the Schedule for the listing, review the item's Title and Sub Title as needed. Review the rest of the information on the item such as price, dimensions, etc. As you list your item on eBay, the Quantity chosen for the listing will be deducted from your store's inventory for the item. Also, please note that multiple quantity listings are not allowed for Auction purchase options. Only Buy it Now will be able to list multiple units for sale. When ready to proceed, click on "Preview Fees From eBay" to review the applicable fees from eBay for the item's listing. When you're ready to post the item, click "Finish" at the bottom. 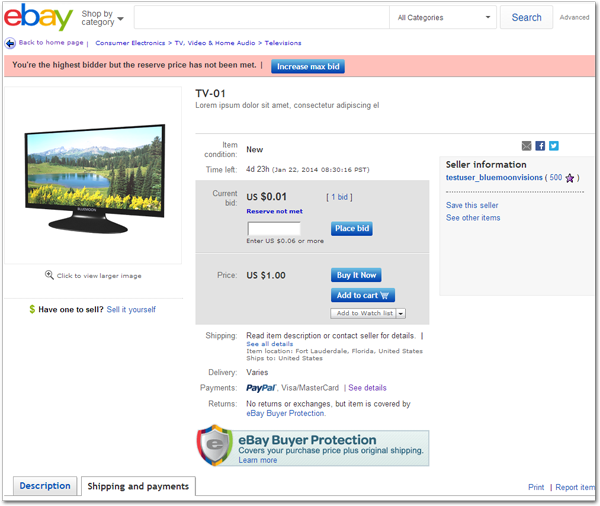 When previewing fees, you will also see a listing of possible errors and/or warnings from eBay on the item's listing. will still allow the listing to be posted. will prevent the listing from posting to eBay altogether and must be addressed. Congratulations! Your item is now listed on eBay! You may now repeat the process for the rest of your items as needed. As orders and auctions are completed on your eBay listings, the integration will also bring those orders into your 3dcart store's Online Store Manager. Once in your 3dcart store, you may review, process and ship your orders as usual. If you've configured your settings to also pull all of your ebay orders, the system will also import your non-3dcart orders as well (up to 90-days) into the 3dcart Online Store Manager. Look to the top right and click on the "Show eBay Orders" button to view all orders. Here you will see a page displaying all of your current and historical listings on eBay. If you have many listings, you can use the page's search filter at the top to narrow your view of the listings based on status, keywords, or specific date ranges. Furthermore, as the listings are displayed, they can be sorted by the name of the product, number of bids, listing type, dates and statuses. You also have the ability to end or re-list items as needed, directly from this page. Click on a listing to review its information. As orders for the item are placed, they will appear at the bottom of the listing information page. Clicking on the order invoice number(s) will take you directly to the order. Clicking on the "Refresh data from eBay" button at the top right will update the listing information and orders from eBay. The automatic updates from eBay occur once every hour. The "Refresh data from eBay" will update on demand. Once there, you can review, process and ship the order as usual to fulfill it. As the order's status is updated, it will then reflect as such on the item listing information page. You can also process eBay orders from your regular order status queues. All orders originating on eBay will be displayed in your order queues with the prefix "eBay" before the invoice number. Beginning with Version 8 of the 3dcart software, you can now import your item listings from eBay. This can be useful if you have items that you sell on eBay that are not available in your 3dcart store and you'd like to add them to your store's catalog for extra exposure. Click on "Import Products (beta)"
This will take you to a page where you will be able to select beginning and end date range to search for your eBay listings. The purpose of this is to search for listings in this time period and download them to your store for selection. Click "Next" to have the selected items imported. The items are listed with the same category taxonomy shown on eBay which will be re-created on your 3dcart store. The system will allow you to select an existing category in which to place the items during the import. click on the "Import" button located at the top right of the page. The store will then take the listing information from eBay and copy the product's name, price, description and image URLs. It will then use this information to recreate the item on your 3dcart store. The import of the eBay Listing will include the product's name, price, description, quantity, and image URLs. It will not import product options, MPN, GTIN, SKU, Cost, Short Description or dimensional information. You will need to add these manually or through a CSV file after the eBay import is complete.